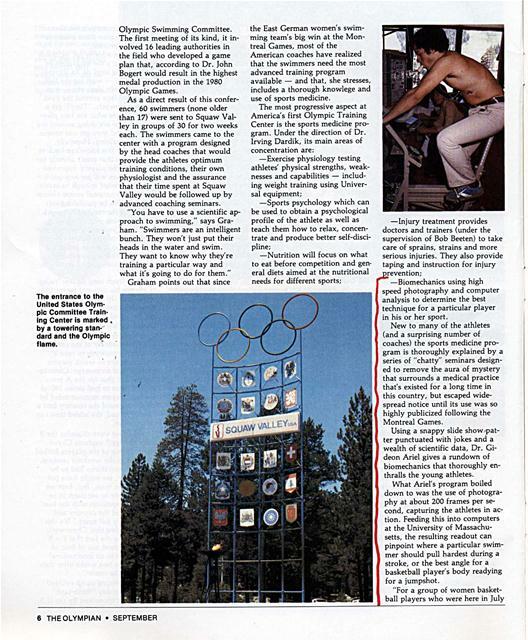 The first USOC Olympic Training Center in Squaw Valley offers elite, and talented young athletes the unique opportunity of its specialized facilities. The sport of water polo is managing to reestablish itself as a winning competitor in world competition, while experiencing the growing pains of internal reorganization. When weightlifter Bruce Wilhelm started his journey to the Friendship Cup in Russia, he had no idea that his travel adventures would almost rival those of the famous Hope&Crosby "Road" movies. 1977.80	John B. Kelly, Jr.
Front Cover: This soccer player is having the strength of his thigh muscles tested by one of the center's exercise physiologists, Dr. Gene Hagerman. Back cover: Blyth Arena, the scene of many events during the 1960 Olympic Winter Games, is now host to basketball, ice hockey and other sports practice and play. The Olympian Is published monthly, except bi-monthly for July/August and December/January, by the United States Olympic Committee, 57 Park Avenue, New York, New York 10016, a non-profit corporation chartered by Act of Congress of September 21, 1950. All correspondence about The Olympian, The Olympic Society or a change in your address should be addressed to the United States Olympic Committee, Dept. KF, 57 Park Avenue, New York, N.Y. 10016. Membership in The Olympic Society includes a subscription to The Olympian, with memberships starting at $12.00 a year. Second-Class Postage paid at New York, N.Y. and at additional mailing offices. 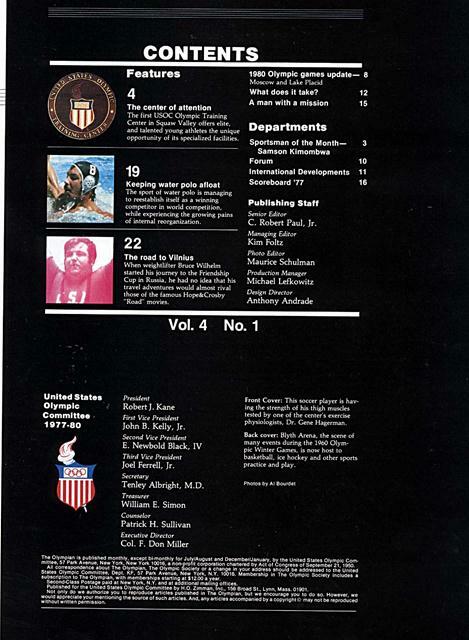 Published for the United States Olympic Committee by H.O. Zimman, Inc., 156 Broad St., Lynn, Mass. 01901. Not only do we authorize you to reproduce articles published in The Olympian, but we encourage you to do so. However, we would appreciate your mentioning the source of such articles. And, any articles accompanied by a copyright &) may not be reproduced without written permission. These soccer players scrimmaged every night for two weeks for a chance to be one of the 18 players (out of 190) that would eventually be chosen for the national A senior team. 0 n a hot summer day high in the Sierra Nevada Mountains, Leslie stands transfixed on the ice. Her gracefully outstretched arms are balancing her as she stands "frozen" on the points of her skates. The clear tenor of John Denver spills out into the silence as Leslie seemingly falls down from her pose, gliding gracefully into a long arc that ends with a cleanly executed double Lutz jump. The tension rhythmically rises and falls as she spins and whirls and smiles her way around the arena until, finally, with a lyrically lithe lay back spin dissolving into the blur of a scratch spin she rises on the points of her skates once more. Her arms float out into place as counterbalance. The sweet tenor voice echoes, then is still. So is Leslie. She is radiant - waiting. There is no applause. The 8,500 seats of Blyth Arena are empty. The tiny 12-year old breaks from her pose, glides to the sidelines for a quick conference with coach and mother, then glides back to center rink and carefully sets herself on the points of her skates - waiting for the music to begin again. just one of the thousands of would-be Olympians that will use the new United States Olympic Committee Training Center in Squaw Valley to test their mettle in their quest for medals. Nestled in an emerald green mountain glen only 40 miles from the greenback glitter of Reno, Nevada, this small California community that entrepreneur Alexander Cushing hand-tailored for the 1960 Winter Olympic Games is undergoing a deft refitting to suit the needs of athletes training for the 1980 and future Olympic Games. 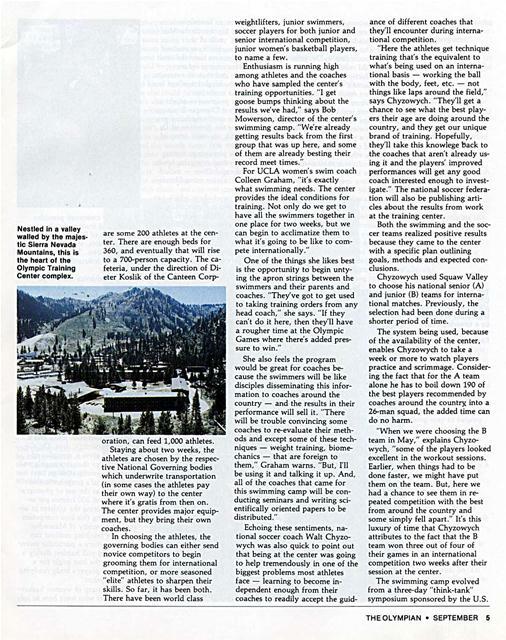 Cushing, the man who made the valley - and owns the mountains - is again playing a part in this "Olympic Movement." Discussions are well underway concerning the athletes' use of the ski lifts, and the center wants to arrange terms for the use of the old biathlon and Alpine runs and the ski jumps. e Enlargement and enclosure of the speed rink, adding a 400m track on top. *Construction of a luge and bobsled run. *Building a 50m swimming pool where the tennis courts now are. ï¿½ The creation of a soccer field. The players are using a "borrowed" field about 10 miles away from the center. *Expansion of Blyth Arena by extending the building approximately 100 ft. The arena, which is now used for ice hockey, basketball and various events, would provide three cross courts for volleyball, a full basketball court and facilities for wrestling practice and training. The center has been proceeding full speed ahead with the sports it can accommodate. The first athletes arrived in May - soccer players from which the national "B" junior team was chosen - and during the summer the center was the temporary residence of athletes from basketball, soccer, field hockey, wrestling, swimming, kayaking and canoeing, ice hockey, speed skating, rowing and weightlifting. Nestled In a valley walled by the majes. tic Sierra Nevada Mountains, this is the heart of the Olympic Training Center complex. oration, can feed 1,000 athletes. Staying about two weeks, the athletes are chosen by the respective National Governing bodies which underwrite transportation (in some cases the athletes pay their own way) to the center where it's gratis from then on. The center provides major equipment, but they bring their own coaches. weightlifters, junior swimmers, soccer players for both junior and senior international competition, junior women's basketball players, to name a few. Enthusiasm is running high among athletes and the coaches who have sampled the center's training opportunities. "I get goose bumps thinking about the results we've had," says Bob Mowerson, director of the center's swimming camp. "We're already getting results back from the first group that was up here, and some of them are already besting their record meet times." For UCLA women's swim coach Colleen Graham, "it's exactly what swimming needs. The center provides the ideal conditions for training. Not only do we get to have all the swimmers together in one place for two weeks, but we can begin to acclimatize them to what it's going to be like to compete internationally." One of the things she likes best is the opportunity to begin untying the apron strings between the swimmers and their parents and coaches. "They've got to get used to taking training orders from any head coach," she says. "If they can't do it here, then they'll have a rougher time at the Olympic Games where there's added pressure to win." She also feels the program would be great for coaches because the swimmers will be like disciples disseminating this information to coaches around the country - and the results in their performance will sell it. "There will be trouble convincing some coaches to re-evaluate their methods and except some of these techniques - weight training, biomechanics - that are foreign to them," Graham warns. "But, I'll be using it and talking it up. And, all of the coaches that came for this swimming camp will be conducting seminars and writing scientifically oriented papers to be distributed." ance of different coaches that they'll encounter during international competition. "Here the athletes get technique training that's the equivalent to what's being used on an international basis - working the ball with the body, feet, etc. - not things like laps around the field," says Chyzowych. "They'll get a chance to see what the best players their age are doing around the country, and they get our unique brand of training. Hopefully, they'll take this knowlege back to the coaches that aren't already using it and the players' improved performances will get any good coach interested enough to investigate." The national soccer federation will also be publishing articles about the results from work at the training center. Both the swimming and the soccer teams realized positive results because they came to the center with a specific plan outlining goals, methods and expected conclusions. Chyzowych used Squaw Valley to choose his national senior (A) and junior (B) teams for international matches. Previously, the selection had been done during a shorter period of time. The system being used, because of the availability of the center, enables Chyzowych to take a week or more to watch players practice and scrimmage. Considering the fact that for the A team alone he has to boil down 190 of the best players recommended by coaches around the country into a 26-man squad, the added time can do no harm. "When we were choosing the B team in May," explains Chyzowych, "some of the players looked excellent in the workout sessions. Earlier, when things had to be done faster, we might have put them on the team. But, here we had a chance to see them in repeated competition with the best from around the country and some simply fell apart." It's this luxury of time that Chyzowych attributes to the fact that the B team won three out of four of their games in an international competition two weeks after their session at the center. The swimming camp evolved from a three-day "think-tank" symposium sponsored by the U.S.
Olympic Swimming Committee. The first meeting of its kind, it involved 16 leading authorities in the field who developed a game plan that, according to Dr. John Bogert would result in the highest medal production in the 1980 Olympic Games. As a direct result of this conference, 60 swimmers (none older than 17) were sent to Squaw Valley in groups of 30 for two weeks each. The swimmers came to the center with a program designed by the head coaches that would provide the athletes optimum training conditions, their own physiologist and the assurance that their time spent at Squaw Valley would be followed up by advanced coaching seminars. "You have to use a scientific approach to swimming," says Graham. "Swimmers are an intelligent bunch. They won't just put their heads in the water and swim. They want to know why they're training a particular way and what it's going to do for them." the East German women's swimming team's big win at the Montreal Games, most of the American coaches have realized that the swimmers need the most advanced training program available - and that, she stresses, includes a thorough knowlege and use of sports medicine. -Biomechanics using high speed photography and computer analysis to determine the best technique for a particular player in his or her sport. New to many of the athletes (and a surprising number of coaches) the sports medicine program is thoroughly explained by a series of "chatty" seminars designed to remove the aura of mystery that surrounds a medical practice that's existed for a long time in this country, but escaped widespread notice until its use was so highly publicized following the Montreal Games. Using a snappy slide show-patter punctuated with jokes and a wealth of scientific data, Dr. Gideon Ariel gives a rundown of biomechanics that thoroughly enthralls the young athletes. What Ariel's program boiled down to was the use of photography at about 200 frames per second, capturing the athletes in action. Feeding this into computers at the University of Massachusetts, the resulting readout can pinpoint where a particular swimmer should pull hardest during a stroke, or the best angle for a basketball player's body readying for a jumpshot. The entrance to the United States Olympic Committee Training Center is marked by a towering standard and the Olympic flame. 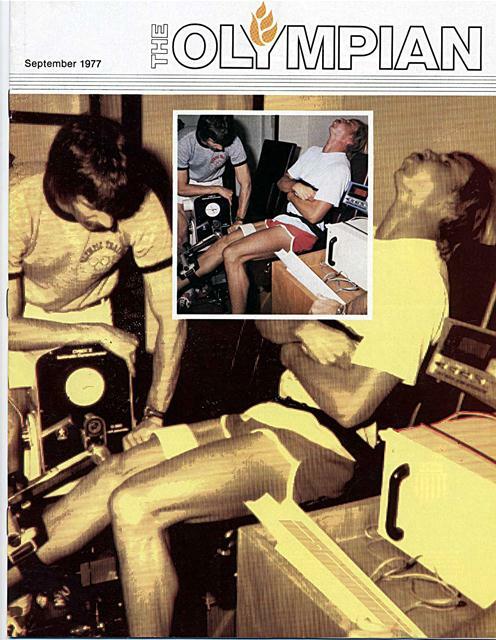 Using this computerized machine donated by Jaeger of West Germany, exercise physiologist can determine the athletes total metabolic and cardiovascular picture. The dining hall, run by Dieter Koslik of the Canteen Corp. can feed up to 1,000 athletes per day. for the tournament," explained Ariel, "we used biomechanics to see if they were using their bodies to the optimum advantage. With one, we found that there was no way she could improve her jumpshot. With another, we discovered that if she'd bend her legs at a different angle she could jump higher. She's already been practicing, and is seeing improvement." While exercise physiologist Fritz Hagerman isn't as entertaining, his enthusiasm is infectious. His eyes widened and the words come fast as he dives into a detailed explanation of the role physiology can play in sports. copy is sent to their coaches, along with an explanation of what it means. The athletes take their turns on a variety of equipment: Cybex strength testing machines, treadmill, cycle, underwater body weighing (to determine the body's percentage of fat to muscle tissue), blood and urine analysis and a computerized Jaeger unit that measures metabolism and the complete cardio-vascular system. Constituting more than $150,000 worth of equipment, all of it was donated. our goodwill ambassadors making parents and coaches aware of the role this can play in sports." The results produced by the sports medicine clinic aren't meant to take the place of coaching. The information obtained here, stresses Hagerman, is meant to help the coach in the "fine tuning" of his athletes. "Only with scientific measurement can we possibly know where the athlete might be lacking and how to push him to his limit," he says. "We're trying to give the coaches information that will help him in terms of gearing the training of each individual so the athletes will reach their full potential - we aren't out to make gene machines." Continuing in their effort to help American athletes gain the opportunity to have training that will enable them to compete internationally and give their best effort in all sports, the USOC recently opened another training center, this one in Colorado Springs, Colorado. Under the direction of Bob Mathias, the two-time Olympic decathlon champion, the center will be headquartered on vacated Ent Air Force Base and the industrial foundation complex. Eventually able to house 500 athletes, the center can currently handle 150. Identical in principle to the Squaw Valley facility, it will also have a sports medicine clinic. After what many critics see as a fall from the previous sports pinnacle held by the U.S. in international competition, the centers should go a long way to helping America's athletes reach their full potential. But, politics and prizes aside, perhaps the best reason for the centers' existance is embodied in a comment between two young exhausted soccer players as they were leaving the field after practice. Generated on 4/20/2019 3:11:51 PM (PST) ADI/HQ/GBA/2019/ARIELCLOUD/v3.0.2018.0126.